When it comes to online gaming, it's important that you own a very good pair of gaming headsets. If you're an avid online FPS gamer, then you'll take this to heart as sporting a good pair headsets could very well be the difference between dominating or being dominated. The challenge however is being able to find a good pair of pro quality gaming headsets at a reasonable price. There are a few notables on the market such as the Turtle Beach Ear Force X31/PX21 and the Tritton AX180. Now you can add another to the mix. ASTRO Gaming has announced their new ASTRO A30 Cross-Gaming headset. The A30 is a professional grade cross platform headset. Cross platform meaning that it works with the Xbox 360, PS3, PC as well as iPod and even smartphones such as a Blackberry. That's pretty versatile. The one caveat to the A30 is that if you want to be able to communicate over online gameplay on your console, you'll also need to purchase the ASTRO MixAmp system. 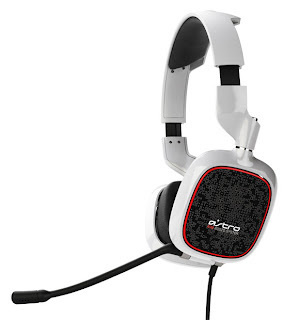 The A30 retails for $149.95 US or as a bundle with the ASTRO MixAmp for $229.95. The A30 looks to combine high quality and performance with great design and aesthetics. And to take the A30's looks to the next level, you can create personalized speaker tags online and swap them with the stock speaker tags. For more details on the ASTRO A30 Cross-Gaming headset, visit the ASTRO Gaming website at www.astrogaming.com. I would much rather suggest something from SteelSeries, or Sennheiser. I personally prefer the Sennheiser HD650's with a desk mic, instead of a headset. The A30 DOES NOT work on a PS3 right out of the box....you MUST have the MixAmp. So in essence, the A30 will cost you $230--not $150. Even if it was $150 and not $230, it's still a passive stereo headset. You also MUST amplify the speakers if you want to hear anything! Why would anyone get this when they can get a Turtle Beach X31 or X11? Both of these headsets are self-powered and have a bunch of features too. Much better choices. Do these headphones block out the idiots online using racial/homophobic slurs, or does it just make them sound better?